Alchohol and Pears Could Be The Perfect Pair! It seems Koreans have been sitting on a secret hangover cure for years, and it is finally being shared stateside. New studies show that consuming 6 oz. of Asian pear juice before heading out for a night of drinking can help you experience less memory loss, as well as less light and sound sensitivity. Subjects also had a lower blood alcohol level than those who did not drink the pear juice. It seems the enzymes in the pear inhibit the breakdown of alcohol. 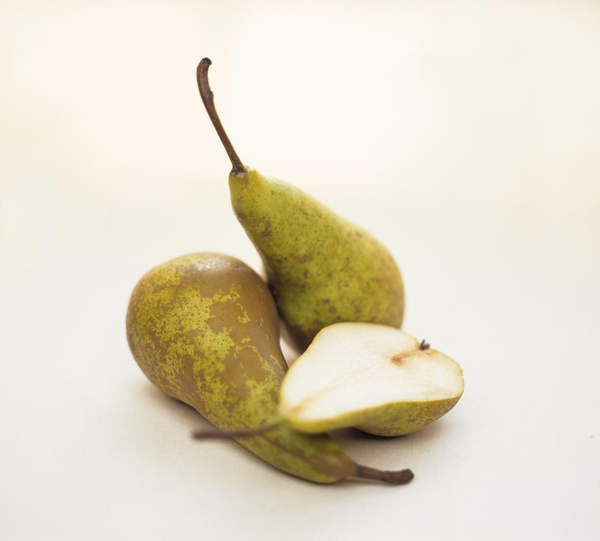 The fact that pears contain high levels of calcium, folic acid, vitamin k and folate doesn’t hurt either. It souds like alcohol and pear juice might just be the perfect pairing for a better morning after. Body acceptance is a hot topic these days. The media is reaching out to encourage women everywhere to love their bodies, regardless of how they look. Body shaming, and setting an unrealistically high (and often photoshopped) bar for beauty is the subject of many news stories and ad campaigns. I completley agree. Women should be able to go to the beach without panicing about their “beach body”(something I am completely guilty of). A jiggle here and a bump there shouldn’t keep women from enjoying their lives. A few extra pounds or a little “junk in the trunk” is nobody’s business but our own. Every story about women being fat shamed, or called out by total strangers for exposing thier stretch marks from childbirth on the beach makes me cringe. It is time that society comes to terms with our imperfections being part of who we are and move on. Ok, so here comes the kicker. I mean, you knew there was going to be one, right? If we should love our bodies regardless of thier flaws, than shouldn’t we love them enough to take care of them? And by taking care of them, I don’t mean going on an all kale diet, exercising three hours a day, or being a size 2. I don’t mean never leaving the house without full pagent makeup and a fresh blowout. I do mean eating healthfully most of the time, getting a moderate amount of exercise and maintaining a weight that prevents chronic and serious illnesses to manifest. I would never, ever make a rude comment to someone of any gender about their weight, or how they look. It is rude, and frankly, none of my business. But, I have a hard time condoning a lifestyle that allows people become so over weight that they develop heart problems, hypertension, diabetes or even joint issues as a result of over-indulgence in food, and a lack of significant movement. Just walking at a moderate pace is considered exercise, yet I watch people circle the parking lot, looking for the closest possible parking spot so they don’t have to walk a few extra feet. Should we tell those women (and men for that matter)that it is ok and they should love their sick, unhealthy bodies as they are? It is all a self fulfilling prophecy. Once the health issues begin to set in, physically being able to exercise becomes more problematic. Once the bad eating habits form, it is very hard to break them. You don’t just wake up one day and decide that you aren’t going to eat all the foods you are used to and stop cold turkey. Super clean eating requires discipline, both in choosing to avoid the unheatly items,and in buying and preparing the right ones. There is not a fast food, convenience store version to fall back on. I get it. Its not easy. Busy women with families and jobs don’t always have time to exercise, and commuting by foot or by bike is often not an option. So is the solution to say its ok, you are beautiful anyways? Isn’t that a twisted way of objectifying women? As health care costs rise, isn’t it cheaper to eat well, and less time consuming to exercise than take time out for frequent doctor visits and sick days? BTW, skinny shaming people, such as celebs like Amal Clooney and Guilianna Rancic is just as offensive. Sometimes being overly thin is a natural state, but it can also signal health issues. We are very quick to say “eat a sandwich” to someone who is very thin, but not so quick to accept someone saying ” put down the cookie” to someone who is over weight. Until we can come to terms with the equality of the situation, we aren’t ready to embrace body love fully. Are we, the media and society in general doing women a great disservice by focusing on accepting how our bodies look, vs.how our bodies function? Friends should stick together. Family should stick together. Pasta, on the other hand, should never stick together. Why do we sometimes get lumps of pasta when other times the noodles slip apart with ease? The answer is not what you might think. Contrary to popular belief, adding oil to the water is not the solution. Sometimes, we all need a little space. The size of the pot, and the amount of water is the secret to cooking pasta well. 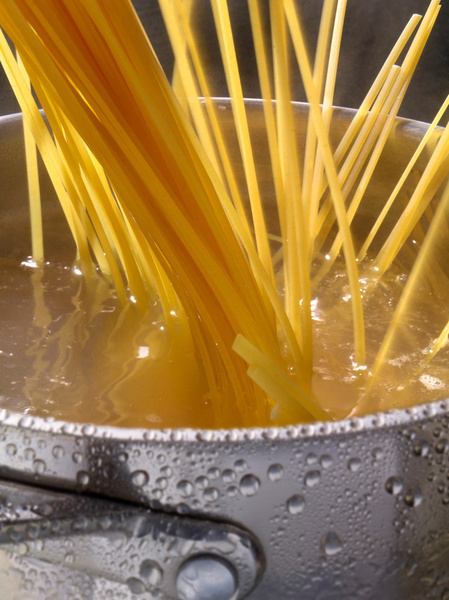 Pasta releases starch when it hits the water, and can absorb nearly double its dry weight in water as it cooks. Not using a big enough pot crowds the noodles, causing them to stick together during cooking. Less water means more starch in the water, and ultimately, gluey pasta. The solution? Use 5 quarts of water for every pound of pasta. Add a little salt, and bring it to a boil. Once the water is boiling, add the pasta, and give it a stir. Continue cooking at a full boil until the pasta is al dente, or cooked, yet firm to the bite. Drain the pasta, but don’t rinse it. The ultimate finish is to add the pasta to the sauce for the last minute or so of cooking. This allows it to absorb the sauce, get perfectly coated, and hit the table piping hot. And why not add oil to the cooking water to keep the noodles slippery and separated? They will become a little too slippery and the sauce will not adhere to the pasta properly. Even if you are serving the pasta with oil, add it at the end. It really does make a difference. We love borrowing from the boys. Slouchy sweaters, crisp button downs, tailored blazers; we like taking the classics and adding a quirky twist to make it our own. Footwear is no exception. 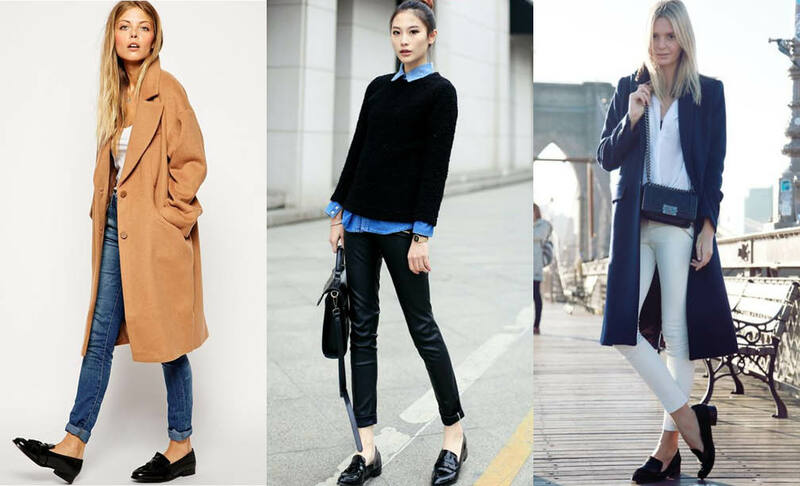 This fall, its time for our beloved oxfords to move over just a titch, and make room for the triumphant return of the loafer. In recent seasons we have seen the rise of slipper shapes and slip on sneakers, but the newest iteration is actually based on the oldest one; the quintessential penny loafer. The back to school staple lives on in upscale skins and new colorations. Skinny jeans, crisp woven shirts and tailored coats work perfectly with shiny new loafers. Menswear checks and colored leather loafers are a match made in sartorial heaven. A hint of patent, or a new twist on the metal horse bit modernizes the look. Gucci got in the game by reinventing their iconic loafer as a mule, lined in fur. One of the Olsen sisters (does anyone really know which is which? )levels up with exotic skins for her loafers and oversized tote. This tip comes courtesy of King Arthur Flour, who has a wonderful blog called Flourish, as well as a beautifully executed new magazine called Sift. 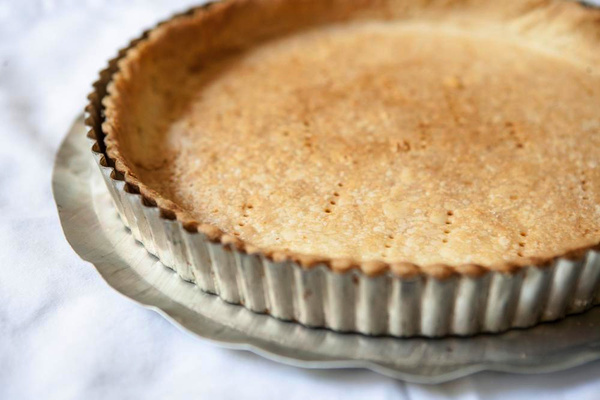 We have done several posts on the perfect pie crust technique, but this tip is one we hadn’t been privvy to in the past. When making pie crust, instead of adding the water tablespoon by tablespoon, try using a spray bottle to get just the right amount of water into the dough. The idea is that using a little less water than normal will yield a flakier crust. They recommend spraying the dough with water and folding it until it comes together, but still seems somewhat dry and crumbly. After wrapping the dough in paper or plastic wrap and allowing it to sit for 30 minutes in the refrigerator, the gluten in the flour starts to relax, the fat begins to harden, and water redistributes itself to make the dough smoother and easy to roll. Those hard bits of fat will work with the flour to make the crust flakey when baked. Try it and see if you notice a difference! Here I am, back on my high horse talking about modern manners. I shared a previous rant about those who don’t respond to invitations, or those who respond and then don’t show up, leaving the hostess high and dry. Today’s rant is about gratitude. 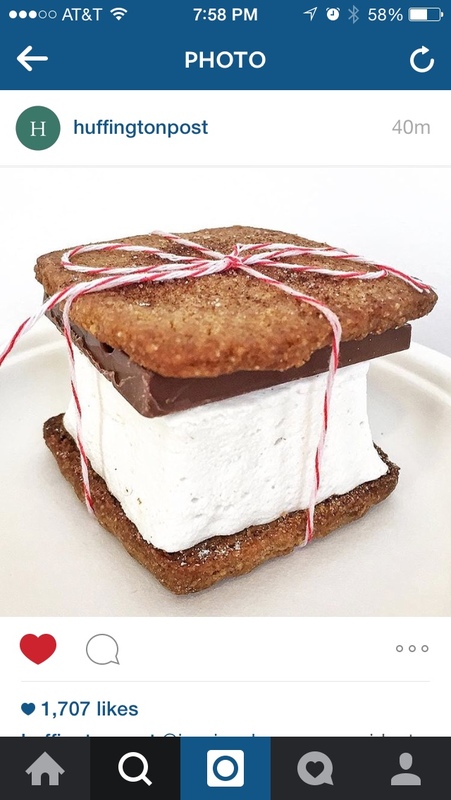 Last week, I made a select amount of s’mores gift boxes and hand delivered them to a few editors and writers I admired, in honor of National S’mores Day. One lovely recipient posted a photo on her company’s Instagram account with a shout out, and the “likes” flooded in. During the course of the day, there were subsequent posts on the company’s other accounts, and a fave on Twitter. The poster also “liked” some of my photos and started following me on Instagram. This resulted in a spike in views on my website and Etsy shop, as well as a ton of “likes and follows” on my Instagram site. To those not social media savvy, I must sound like a 15 year old, seeking validation from others, one click at a time. Those who do this for a living know that it is the way we grow brand awareness in 2015. I am extremely grateful for the support these people showed me, and they completely outdid themselves with multiple posts that put many thousands of sets of eyeballs on Indigo Jones Eats s’mores. I ‘grammed and tweeted my appreciation back at ’em, sharing the joy with my miniscule amount of followers. Its up to 4.837 likes now, on this one shot only! The other four recipients did not respond at all. Not a peep. Before we get too carried away, I must say that my intent was not 100% pure. This was a public relations initiative, and the desired response was social media exposure. A well placed tweet, or a tagged Instagram shot is worth a thousand words of thanks. ( See above.) But if for some reason they didn’t want to play; perhaps an overwhelming amount of free items flood thier offices each week and policy prohibits them from issueing a public acceptance. 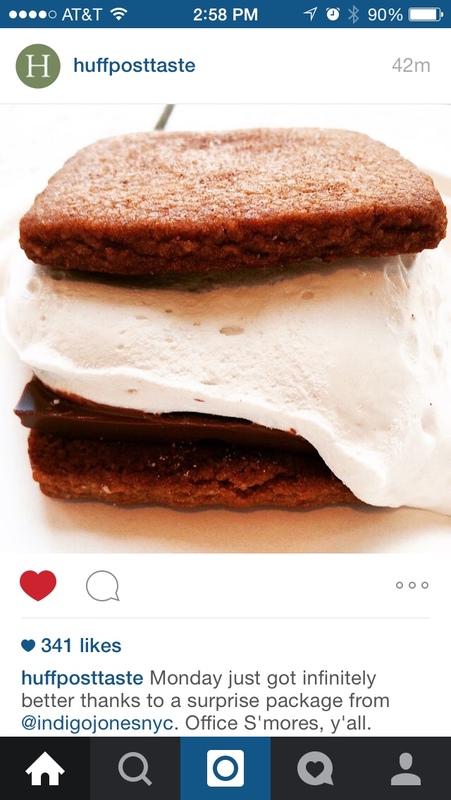 Perhaps they ended up in the office pantry, gobbled up before they could be ‘grammed. Maybe they didn’t like marshmallows. Whatever the reason, its their perogative not to display my wares on their social media sites if they don’t want to. I completly understand and support that decision. I knew going in that I may or may not get a public response. I did it with the intent to grow my brand awareness and expose Indigo Jones Eats to a broader audience. I do however, feel I deserve some sort of confirmation that they actually got the package. I am not expecting handwritten notes on beautifully letterpressed cards, although I suppose they could be in the mail as we speak. I was expecting that their assistant’s junior intern might shoot me a one line email saying thanks for the treats. As an aside, some of these people have posted dog pictures, old photos of haircuts past, and their latest manicures, so I know they are around, and posting mindless follies. Hence, the Miss Manners in me emerging once again. Shouldn’t there be some form of office protocol to respond to what must be, for some, a huge amount of promotional gifts? I certainly would want my brand to be known as gracious, appreciative and at the very least polite to the outside world. I have to say that it skewed my perception of these people ever so slightly. Hey guys! Did you like my s’mores? If so, how bout giving me a “like”? In case I didn’t mention it, its indigojonesnyc. Ok, thanks, bye! It seems that there are as many fads in the healthy food arena as there are in fashion. 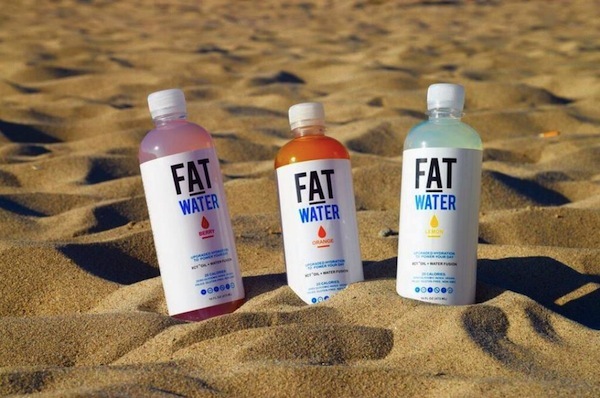 The latest introduction to the energy drink forum is Fat Water. Yep, you read that right. FAT WATER! Created by Dave Asprey, who brought us bulletproof coffee (adding grassfed butter and coconut oil to your morning coffee) is now touting the benefits of his coconut oil infused water. Using his proprietary blend of XCT coconut oil, Asprey contends that the drink will give you energy, help you lose weight, and make you feel great. Sounds good, right? Some experts are debunking the idea that adding fat to water has any health benefits, or aids in the absorbtion of the water. While fat is no longer demonized by the nutritional community, drinking it is a questionable practice. Bulletproof coffee has its share of expert doubters, and an equally large share of proponents, who claim they feel great, have sharper mental acuity, and feel full for hours, allowing them to eat less and ultimately lose weight. As for Fat Water, I think I will stick to my reusable bottle filled with filtered H2O and save myself the $3.95 plastic bottle of water, fat, and artificial sweeteners until further notice. 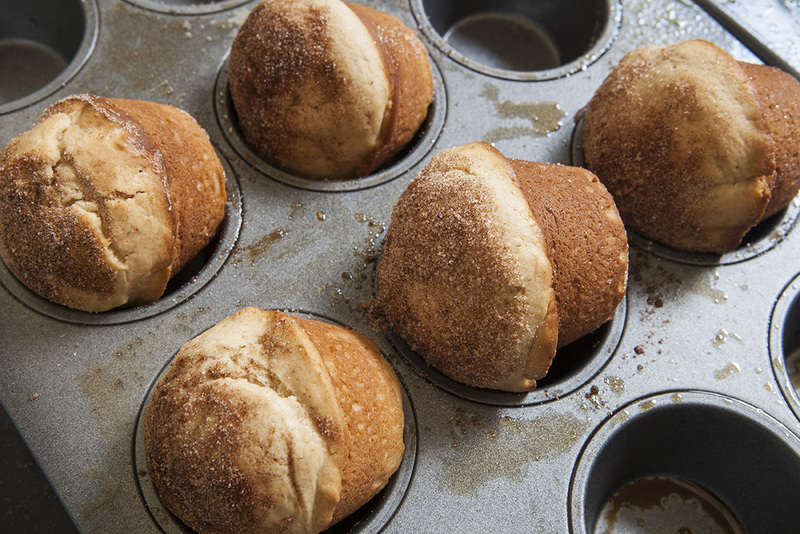 When we take muffins out of the oven, we like to flip them onto their sides while still in the pan to let the air circulate as they cool. This prevents the bottoms from getting soggy. Use a fork to gently nudge them over so you don’t burn your fingers. Once they are cool enough to handle, move them to a wire rack until ready to store. It’s National S’mores Day! Who knew? While it may not be the most important holiday for most, around here it is pretty special. For us it celebrates homemade graham crackers, fluffy artisanal marshmallows, rich milk chocolate, and an opportunity for shameless self promotion. What’s not to love? 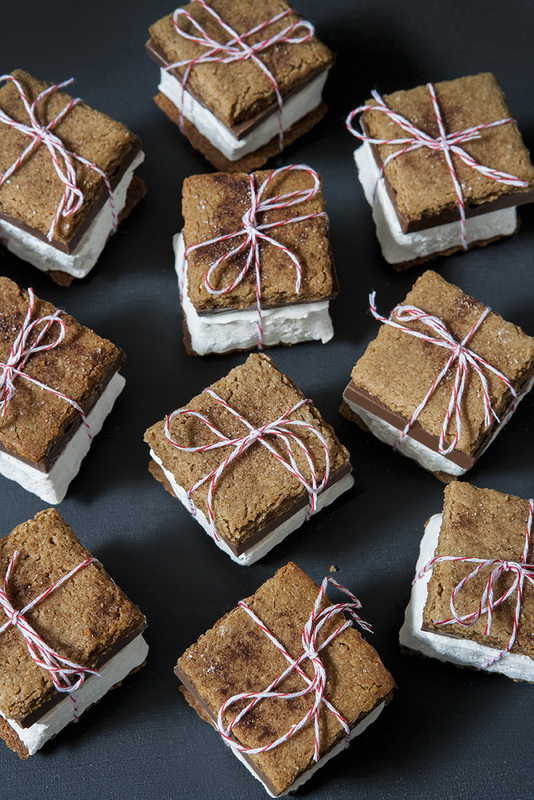 You may have missed S’mores Day, but you don’t need a holiday to enjoy our homemade s’mores. Just head on over to indigo jones eats or our Etsy shop to see all the flavors and shapes we offer, and place an order. Easy peasy. Summer berries seem to be at their peek right now. They are plump, juicy and sweet, and don’t need much to turn them into a delcious dessert. 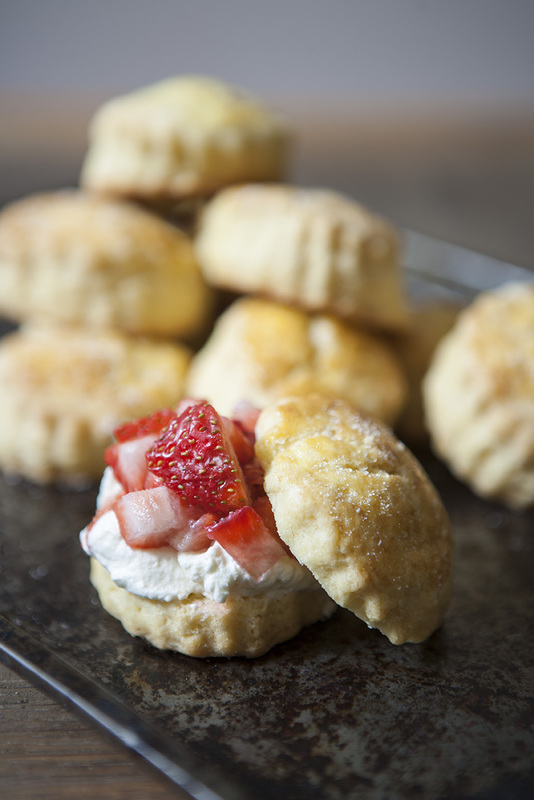 We love making these little mini sweet biscuits, which we fill with whipped cream and fresh strawberries. They are just sweet enough to make the transition into dessert territory, and the perfect foil for the rich cream and fruit. They are like your very own miniature strawberry shortcake, and we bet you’ll opt for more than one! Sift together 2 cups of flour, 2 tablespoons of sugar,1 tablespoon baking powder and 1 teaspoon salt and place it in the bowl of an electric mixer. Add 1- 1/2 sticks of butter, diced into small pieces and mix until the butter is the size of peas. Add 2 eggs (slightly beaten with a fork ) and 1/2 cup heavy cream. With the mixer running on low, add them to the flour/ butter mixture and mix until combined and a sticky dough forms. Dump the dough onto a well floured surface and knead so that it comes together and is workable. Roll until the dough is about 1/2″ -5/8″ thick. Using a lightly floured round cutter, or a drinking glass with a diameter of about 2″, cut the dough into rounds and place on sheet pan. Brush with an egg wash (beaten egg and a little milk or water) and sprinkle the tops with sugar. Bake for 15-20 minutes, until golden brown and cooked all the way through. Allow to cool. 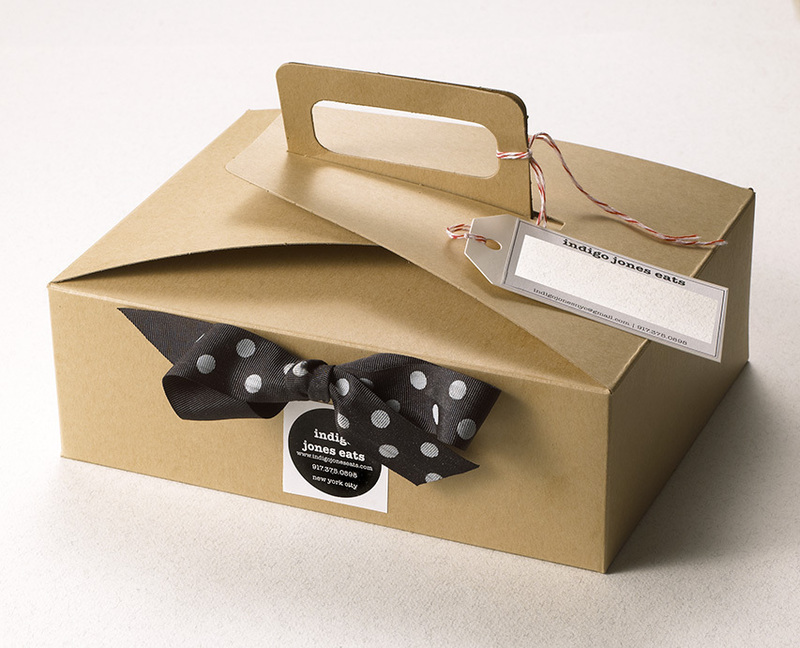 To serve, slice open and fill with whipped cream and fresh strawberries. You can substitute ice-cream or frozen yogurt for the whipped cream, and use any fruit you like. If you want to get “fancy,” marinate the berries in Grand Marnier or a little aged balsamic vinegar before serving, and enjoy! !